There will always be times when you cannot get the things you need, even when you have money to spend. I was discussing with a friend different ways that we used to make things last, or substitute things, for the things we needed. Here are some "what ifs" and some imaginative ideas for making-do. -The price of gas gets so high, you cannot afford to fill up your tank as often. 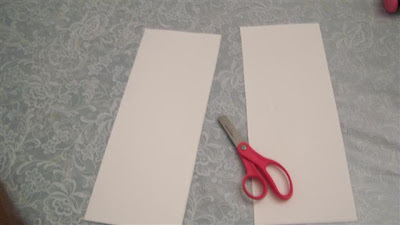 -You love to sew, but there is no available fabric store. You can't even find a zipper or buttons. -You need to do some sewing but you don't have a sewing machine. Contentment must first be learned first at home. 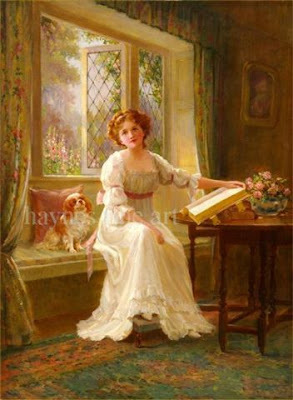 If a girl is not content at home, she will not find contentment for very long in any one place. It is not Contentment is having a deep, abiding sense of well-being and happiness, even when things around you are not ideal. One way to gain the ability to be satisfied with life, is to have a steadiness of purpose. Although it may rain when you wanted it fine, you are able to quickly find a substitute activity that will be useful and beneficial. Contentment sometimes depends upon your ability to be resourceful, a trait which can also be learned by substituting things when you do not have what you need. Being resourceful means finding different ways of doing things when other plans fail. Steadiness can be achieved by sticking to something until it is completed, even if it cannot be done all at once. If this is not practiced, it may be more difficult to stay dedicated to other kinds of duties which require more commitment. Many women are restless and unable to understand that there will be an end to some trying times in life, and they will not put up with any inconvenience or any boredom or any hardship. If they learn at home, they are much better prepared for life's ups and downs, and can be content, even when others around them are undependable, disloyal, rude, or ungrateful. 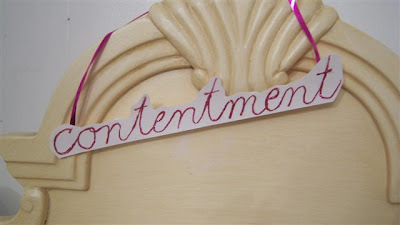 Contentment also means being able to accept where God has put you in your life. Are you a daughter, a wife, a mother, a grandmother? Do not run away from it and try to alter your life unnaturally. Contentment means to make the best of whatever you are, in whatever place in life you are. Discontentment brings on uneasiness and instability. Discontent makes it difficult to settle down or concentrate on worthwhile things. 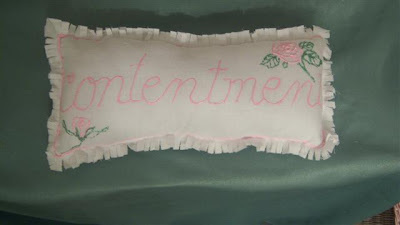 Contentment means waiting out the boring or sad times, but staying to the same course you set out on. Many people, in moments of discontent, abandon their families or their interests, and go off in pursuit of happiness. Happiness is achieved by getting through those times when your life does not seem to be "going anywhere." If you will learn contentment, you can save yourself and your family a lot of grief. I know some young ladies who live at home with their parents, and they are a great help to them. Although they have friends who are always changing addresses, changing room mates, changing mates, changing jobs, and in general living a life of continual turmoil, these girls can always be dependent upon to be the same. Although they reside in the home of their childhood, these grown daughters are by no means uninteresting. They find interests in many different things, such as helping the elderly, letterboxing when they have free time, rearranging the furniture at home, and decorating seasonally for their mother, entertaining, sewing and cooking, all which take enormous amounts of time. They have no want of money, because someone is always gifting them for a service they provided or for making something for them. One of these girls raises sheep and collects the wool for felting. Her felted projects are so colorful and it is interesting to watch her do it when she visits us. These girls have learned to do so many things and sometimes take on new interests, but their basic relationships remain the same. They have a stable and predictable family loyalty that they will not violate by being discontent. Some of their friends are restless girls who do not know what to do at home. They would be better off to be content and help their parents, who put a lot of effort into raising them, than to spend so much time and money pursuing things that are worthless and bring no tangible results. Philippians 4:11 - We are to be content in all circumstances, both when we have abundance, and when we do not. First Timothy 6:6 - Godliness with contentment is "great gain." First Timothy 6:8 - Two things we should be content with are food and clothing. Hebrews 13:5 - Be content with what you have. I think we can easily say, that these verses show that contentment is pleasing to God and that he blesses us even more when we are content. When we are content, we are careful with our posessions, careful with our bodies, careful with our relationships. That brings manifold rewards, in due time. Being discontent is being out of step with the creator and the creation. Discontent is a false leader and has led many people away from the stability of their families. A foolish woman is discontent, and can cause the loss of her own home. One reason that some daughters do not want to stay home and apply themselves to becoming creative home keepers, is that they have not learned contentment. When they do not learn how to be content, they become restless, and unable to take home living seriously. If the outside world is constantly tugging at her and she is listening to the voices of those who say that she cannot be fulfilled at home, she will become discontent. Once she begins spending more time away from the responsibilities of the home, or from her family, she becomes even more restless and detached. She will attach herself to other people and other things not meant for her. Contentment is productive. It finds things to do that are constructive and not destructive. The discontented person is also destructive in that they waste time, waste money, waste talents, waste personal possessions, and waste life. The best thing to do is to become oblivious to the voices that call us away from the important work of the home and concentrate on the tasks available to you. When young women develop contentment, they can have satisfied minds, free from disturbance and inner conflict. 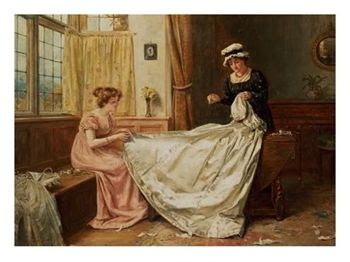 Women who sew or cook or putter around their homes, crafting and creating, tend to be more content at home. Here is a simple craft for young people that illustrates this lesson. 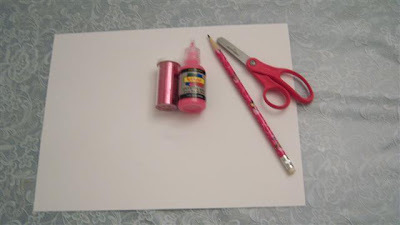 Materials needed are pencil, scissors, glitter glue and extra glitter, and a regular size piece of card stock. 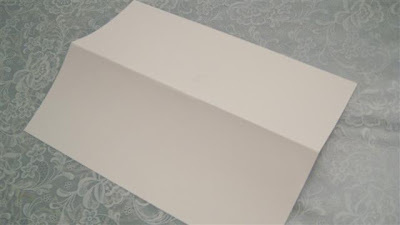 Fold the cardstock (any color, any pattern you have) in half. Then fold one of the halves in half again, and stand it up. extra glitter on it. The folded pieces stands up on a ledge or shelf as a reminder. 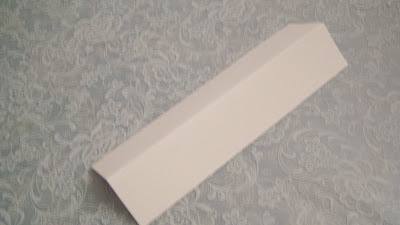 As an alternative, cut around the word and tape a piece of ribbon (the kind you use to wrap gifts) onto the back of the sign,and hang up somewhere--over a mirror, around a cupboard knob, over the edge of a picture or on a piece of furniture. 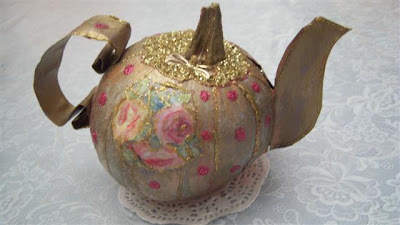 I am sure, with imagination, a lot of different embellishments could be applied to this piece to make it beautiful. The camera did not catch the glitter, but it is very shiny. printable word to use on cardstock in your printer, or use for embroidery on a small pillow. Contentment is found in noticing and mentally drinking in the natural things in life: the sunset, a raindrop on a leaf, the smell of spring, white clouds in a blue sky. Contentment is also attained by appreciating the simple things we use daily and caring for our belongings. 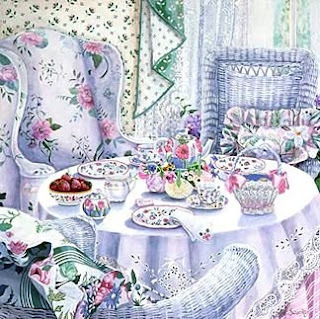 From setting a table attractively and appreciating the china and the tablecloth, to dressing carefully in something clean and pretty, we can find contentment. Discontentment comes when our minds have been distracted by the world. 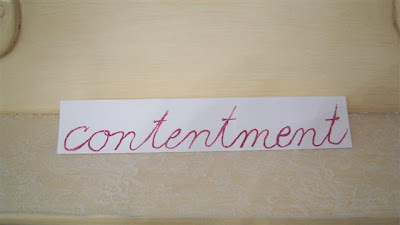 Contentment comes from concentrating on things at hand. 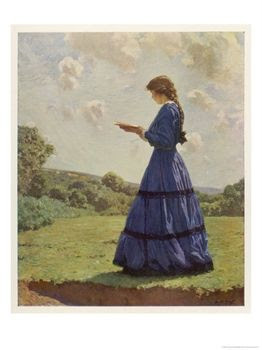 A contentment notebook would be a very good way to make a young person aware of things that bring contentment. By writing little things in it that are of nature or daily life, a sense of contentment can be created. Someone asks, "What about boys and men. Should they be content at home?" Yes, they should, but to a large degree, their contentment at home is dependent upon what kind of a home their women make for them. If the women are humming like busy bees, making the home clean and comfortable, putting good smells in the air with food cooking, making sure clothing is clean and pressed . sewing a new tablecloth or curtains, making dresses, and having happy little hobbies that express contentment, the men are going to sense that something important is going on in that home. Young girls at home need to learn to make a home for a future husband and children, that will bring them contentment. CONTENT, n. 1. Rest or quietness of the mind in the present condition; satisfaction which holds the mind in peace, restraining complaint, opposition, or further desire, and often implying a moderate degree of happiness. -Does not abandon the protection of the family. Does not condemn the home or scoff at home life. -Seeks to aid the family members in being successful with their own talents and work. -Is undergirded by an awareness of blessings. -Does not run away when things get difficult. -Finds things that need to be done. -Blooms where it is planted. -Makes the best of things. Contentment has similarities to love, in the 13th chapter of first Corinthians, in that it always hopes for the best and endures all things. 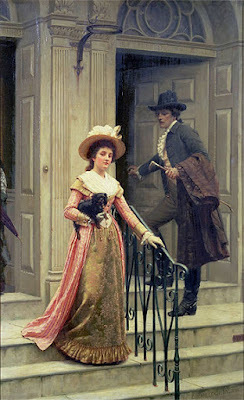 Edmund Leighton painted pictures tht depicted a nostalgia of chivalry. 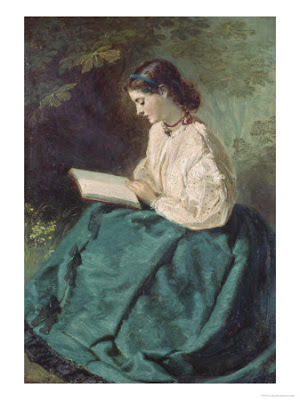 This painter was a wood engraver and a book illustrator. This artist studied architecture before becoming a painter. 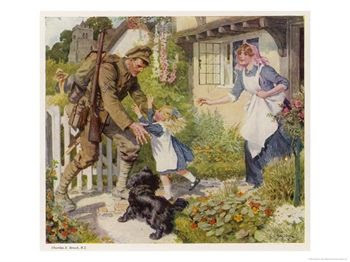 Just a reminder to look at www.lovelywhatevers.blogspot.com for the latest addition of pretty calendars. 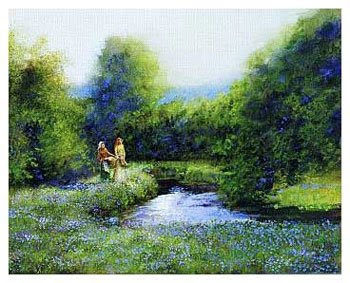 They are great art for your home, and the cost actually only amounts to about $1.00 a month. The newest calendar on this site is a Sandra Kuck edition. 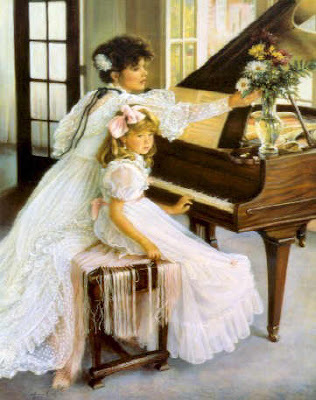 "The First Recital", above, is one of her paintings, but this one is not in the calender. 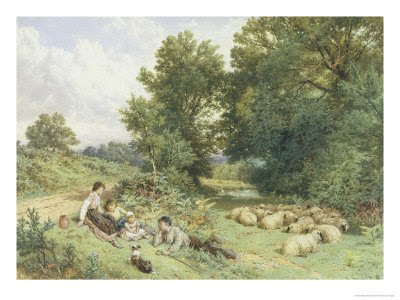 However, all the paintings on this new calendar are just lovely if you like that kind of art. 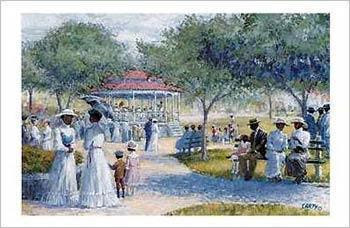 My "staff" and I will be searching around for a calendar for African-American ladies, to add soon. I like the art of Melinda Byers and Consuelo Gamboa, which I have also featured on Lovely Whatevers. 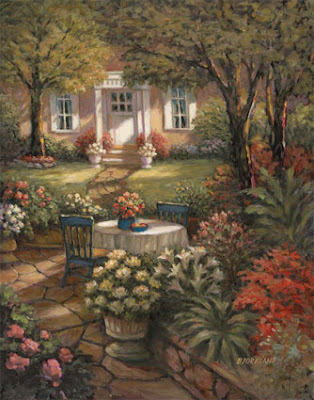 Scroll down and see some other beautiful art calenders of scenery and still life that will enhance your home. I have been asked to write on several different subjects, and hopefully, I'll be posting on them, in the near future. 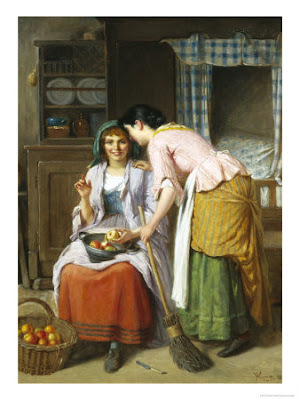 Be sure to visit Little Jenny Wren a blog of a contented homemaker. Sometimes we are without words, when people need real sympathy. For any loss or setback that anyone is suffering, the main thing is to soothe them in the best way you can. To do this, just imagine what would help you the most and what would send you further into discouragement. I was going through my picture file collection and found this. I do not remember what craft site it came from. 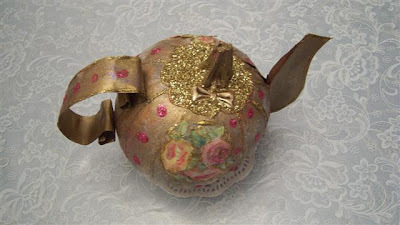 It is a purse made from a Kraft macaroni dinner box, embellished withfabrics and sewing trims. I don't know the instructions, and I probably would never get a boxed dinner and I don't eat macaroni, but the idea is very creative! There has been a big computer-parts switcheroo around here, with some people in the family needing screens, and others keyboards for various work places and other things, and so I have been adjusting to a different keyboard and screen, hence my lack of entries these days. Also, I have been getting the house more orderly and trying to catch up on some sewing. I hope to do several posts soon, including the request from the lady who commented about managing a home life when your husband has a job that takes him a way most of the time. 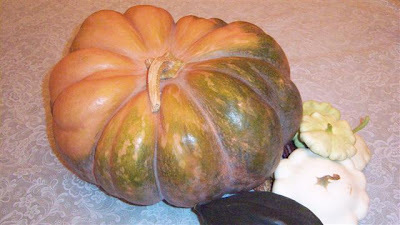 I have my fairytale pumpkin all shined up so that it looks like there are streaks of real copper and gold and silver on it, and it sits in the middle of the little table by the couch in the front room. I understand these can sometimes last a whole year if you keep them outside or in a cool place. They can be used decoratively, but I have not tried to eat one yet. Above, is a picture of the one I bought at Safeway. I had to ask at produce if they had "fairytale pumpkins" and they took me to the back room where they stock everything and let me pick my own. I felt like I was buying contraband, the way I snuck in and back out again. There were so few of them in the pile and I got the most colorful one I could find. I went to see what my daughter and her husband were doing last night, and found them watching a movie on their computer. Apparently if you belong to Netflix and are getting DVD's in the mail, you can also watch anything you want on the web, as well. That makes it really worth the money, and it is nice that you can choose exactly what you want to see. Last night, they were watching a movie called "Arranged," and it really did my heart good! I laughed all the way through it. It was a very happy movie, although it looked, at times, as if the two girls involved, one Orthadox Jew and one Muslim, were doomed to get matched up with men with no hair or huge egos. In the end, they actually had the choice of whether to "settle" or not settle, and it ended up quite happily. There were several scenes that homeschool girls would have totally identified with: both were ridiculed for dressing so modestly. One was offerred money to go and get something more alluring, but she turned it down. After so many comments about how they weren't married yet because of their religion, one of them said something like, "We aren't allowed to think about men, because we are too confined at home and dominated by our over-bearing fathers." That is the common belief by "outsiders" when young women are enjoying the oversight of their parents, in choice of a mate, and it amused me to hear it said by the girls that were being scrutinized. 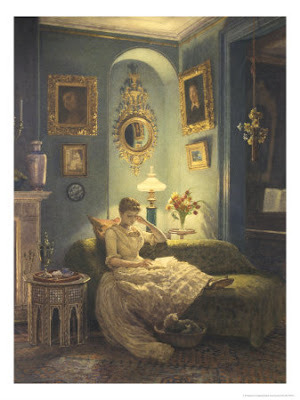 Another scene depicted one of the young women visiting a cousin who had left the family and gone to live in an apartment by herself. She invited her to a party, which totally disillusioned her. Everywhere she turned in that house, there was smoke, loud music, strong drink, immodesty, and pairing up. She decided it wasn't a choice she wanted and returned home. The scene showed the awkwardness that MANY people have felt when they go from a wholesome family life to the seedy world of "independence." I was a little apprehensive that this scene might show something I didn't want to see, but it made the point and moved on quite nicely. I did not get in on the beginning of this film, so I don't know if there was any coarse language, but still, I got a big kick out of it and felt there was a lot of love in the families. I especially enjoyed the Jewish mother and grandmother in the film, who, having grown frustrated at the daughter's turning down so many men brought by the match-maker, reached over and grabbed each other's hands and lifted their anxious faces to Heaven to thank God for his mercy, when the daughter finally approved of one of the candidates. Her friend, also happily engaged, said to her, "...and he has TEETH!" If you are worried about money, in connection to being able to be home full time, there might be something here for you. When I was growing up, there was rarely a woman who was "worried" about money, or where it would come from to support them. Most wives knew they could trust their husbands to provide for them. Most men and women understood that the husband would worry about how to get the money, and the wife would learn how to pinch a penny and save it and guard it with her life so that it did go out the back door as soon as it came in the front. "Let me worry about the income," he said, 'And you are free to care for the home." It is not a good thing that the younger women worry and exhaust themselves over making money, today. Part of this is due to their education and upbringing, where they are told consistently that they will have to take care of themselves and earn money. They do it at such an extreme, that some of them actually risk their health, their rest, and their lives. Many women are taking over men's jobs, using heavy equipment, that are very dangerous, and some have actually become debilitated and left their children almost orphans. That is one reason women need to get back to home making and men need to protect the women by being the breadwinners. One thing that we were careful not to say was "My husband does not make enough money to support us." It would really have embarrassed a man, hurt his feelings tremendously. Such a statement would have been very demeaning to his basic existence as a man. Instead, women would try to find a way to help their husbands succeed and advance in the areas that they needed, by being happy, contented, and emotionally supportive. It was not difficult for men to want to provide the best for such women. If you are worried about money all the time, you are probably missing out a lot on the joy of homemaking. Women should not worry about earing a living. They should be free to fix up their houses and hum and sing while they think about what to make for dinner. They should be absorbed in how to do the laundry so that the family clothing doesn't look like something they dragged from a rag bag. They should enjoy things like ironing and cleaning and decorating and sewing. One of the things that has robbed women of this domestic happiness, is worry over money. They worry over it to such an extent, that they take over the man's realm, and sadly, the men let them. As Taylor Caldwell wrote in her essay so many decades ago (Women's Lib, on the theme articles here), when women first began working outside the home so much, men said, "Let 'em work," and began to complain about their bad backs. By worrying about money so much, women enable men to be negligent providers. If they know the women are dependent on them and have confidence in them, they will be more likely to work and to want to work. If the women are just waiting for a chance to jump in and work outside the home, the men will let them. If you worry about money, there are ways of eliminating the need for it. One way that we have enjoyed is by planting a garden. Even if the food lasts only during the summer, or only for a few meals, those are food items you did not have to buy. Everyone will admit that we are too dependent on the grocery store, and that it is our highest expense after house payments or rent. There is a way to overcome this just by planting something. Our lawns, even if small, cost us more to maintain than they return, when you count the cost of gas to run the mower. Just by turning the edges of the lawns into food-producing rows, you prevent double expenditures. People will think you have very interesting ornamental shrubs when you plant veggies along the sides of lawns and flower beds. If you have no available lawn, you can always get a pot with some dirt and plant at least one thing that you enjoy eating. My favorite is the tiny cucumbers, commonly called "pickling cucumbers" that I love to eat raw and in salads. This is money I don't have to spend, that can be used to pay a bill or buy gas for the car. Speaking of gas, you also can cut down quite a bit on running around in the car by seeing how many days you can stay home without going somewhere. Break up the isolation by inviting people to come to see YOU. Then, ask your husband to stop at the grocery store on the way home from work. My husband just loves to do this. There is very little that men can spend money on these days that is affordable, and he likes to see what is new at the grocery store. He enjoys the break from the monotony at the work place, and always calls me to ask if there is anything he can bring home. I try to grow or make everything myself, so that I have the money for things I cannot make: olive oil, flour, fish, some fruits, and various other items. If you are still worried about money, use only the power you need to function. It is not necessary to have lights and heat on in every single room if you are not using those rooms. Bundle up with more layers of clothing in winter, and learn to dress in light colors and cottons in the summer. Figure out a way, as our ancestors did, of making a natural breezeway in the house, where air can flow more effectively to draw coolness in summer and warmth in winter. Other ways to avoid spending money are just endless. Avoid the pressure from friends to have clothes and things just because they think you ought to. Sometimes you might get invited to a party where some kind of clothing is required, at your expense. You can always refuse to attend and invite the entire party to your home later on in the week for a tea in their honor. This can apply to weddings, where you might be pressured to buy a certain dress, or to other high-end types of celebrations where you do not want to buy an item that you will use only once, or even buy it at all because you don't really NEED it. Cutting out fake food (hot dogs, potato chips, pop, packaged mixes) and learning to make delicious main dishes and even desserts from natural ingredients, can prevent over-spending. If you eat only what is in the garden, you can actually survive, as many people before us have done. However if you do not have a garden, you can at least buy foods that God made, in the closest state of natural that you can find. As usual, I know that there are readers all over the world who have lived happily on their husband's income, worrying only about looking after the home, and still come out with a profit. You are certainly welcome to comment about it. As you spend less and less, you will gain a stronger feeling of security. We have almost forgotten what money is for. We have been told for decades that we need to keep earning it so we can keep spending it. We need to change our attitude toward money so that if it can no longer be earned, we do not need it. We need to find ways to be less dependent upon it so that when hard times come, we do not have to worry. The Bible teaches this principle when it talks about sowing, reaping, and saving, and giving, the latter being an important principle of prosperity. Worry about money may become a habit that is hard to break. Women need to concentrate on making the home a wonderful place, without having to have expensive things, so that they can cut down on the worry, but they also need to get in the habit of being good homemakers. In my opinion, just being a good housekeeper prevents spending, because you don't destroy your property and have to have things replaced, and you don't lose things and then have to go to the store to "find" them again because you are in too much of a mess to find what you need. I have seen women spend way too much on cleaning products because they did not remember that they had already bought something and stored it away somewhere. You don't reallyu need cleaning products if you are trying to cut back. You can do a lot of effective cleaning without the storebought chemicals. I'm sure everyone will enjoy "Under the Gables" today! Please check in on Lovely Whatevers. We have sorted through all the "junk" at the online art stores, and found the prettiest calendars for next year. Everyone knows I try to be ultra-frugal, and not spend money if I can help it, but the calandar is with me all year and I think the pictures we stare at all month are so important, especially if there are children around. The choice you make in a calandar will feed your mind with beauty or with discouragement, so it is worth the money to get a really high-classed calandar. You can use it again for scrapbooks, and even frame the pictures later on. We are going to keep searching and adding more pretty calandars to this site, so if you know of any that are not there, please post them here. Would the women who are "in over their heads" or lacking in homemaking skills, be willing to indicate on a post as to what approximate area they live? We can find volunteers on this site, maybe, to go and give you a little help. This young woman feels that she is disorganized because she was once working outside the home and just never caught up. I can tell you it happens to everyone, even if staying home full time. Please write in your comments, and I will add my comment to the article when I have time. I wanted to ask if you might address something I'm struggling with greatly. I have 3 children. I pulled my daughter out of public school in April. She's 8, and I'm now teaching her 3rd grade. I also have a 5 1/2 year old son whom I'm teaching some math and how to read. And, lastly, I have a 13-month old baby who is very demanding. My problem is I've worked most of my marriage, and I feel like I still have one foot out the door. My husband and I struggle financially. We put ourselves in a tremendous amount of debt in our 20's, and we spent our 30's trying to figure out how to pay it down without changing our habits. The last 5 years, we've suffered some significant health issues, lengthy unemployment, and the birth of 2 of our 3 children. While we've paid off a lot of debt, we've also incurred more because of some of those issues. Because my foot is still out the door wanting to go to an office and make money (I have very good earning potential), I'm not doing the things I need to do at home. I believe, especially after reading your blog for awhile, that, if I were able to commit to this 100%, my husband's health would improve, and the spirit in our home would improve. I'm not organized, and my children have never seen our home tidy, much less company ready. I'm embarrassed to bring people over. It's all on me, and half the time I don't know where to start. I've managed to do some of those small things you mentioned in a recent post - laundry is usually caught up and the kitchens stays mostly picked up. But, we have piles of things everywhere that I can't seem to get to. I've got years of papers to be filed. I have never decorated our home, and it looks like we just moved in a few weeks ago. Homeschooling truly doesn't take as much time as I thought it would, but it does take chunks out of my day. When I actually accomplish something, it seems to take me all day long, and I feel like I don't get to spend time with the children or relax with the baby. I also find myself totally exhausted, and it's just easier to let the mess lie. My schedule is very disjointed. I'm actually a good example of a woman who should have stayed home from the get go, just enjoying the time at home, learning to live frugally, and working on routines before the family comes!!! Any advice is most welcome. Here are a few things that have helped me in the past. 1. When I first learned to take care of your appearance at the beginning of the day, it practically launched me into having a successful day at home. It helped me approach the job more professionally. Spending the day in pyjamas and slippers can give your mind the message that you are going to be casual, and your job suffers from a casual approach all day. Dressing up, and wearing shoes, gives it a professional approach. Dressing up in pretty dresses was important to me, because I didn't want my family to have memories of me in the same old thing day after day, looking oppressed and tired. Today I have Miss Lillian and the boys around me a lot, and I want them to remember their grandmother wearing the enchanting little cotton prints and clear colors, with the trims and buttons and laces, my hair done up, and even pretty shoes. If you have a baby to care for, I'd highly recommend that you let someone come over and fix your hair and give you a facial. Everyone seems to know of someone who does in-home demonstrations using a particular product they are selling, that they could invite over. 2. Having one wall decorated, or at least a portion of one wall, really motivated me when my children were little and the housework seemed insurmountable. Somehow, that little arrangement on the wall, with a mirror, a picture, a candle sconce and a shelf, gave me a starting place. I wanted to expand the area beneath it and clean the floor and put something there that was nice. When you have young children, wall decorating is the best because it won't get in the way and no one can touch it. Just hang a picture and put some complimentary accessories around it, whether it be a wreath or light of some sort. That one wall gave the tone for the rest of the house, and I kept going back to look at it. Then, I wanted to do the rest of the house in a similar way. That way, it was not all just cleaning and hard work, but a kind of crowning glory on top of all the labor. 3. Inviting someone over for a cup of tea and a scone is a great motivation to getting something done in a reasonable amount of time. I found if I made an appointment for someone to come over in a week, I looked forward to it all week and worked toward it. 4. Getting the front room or front entry way completely presentable, and maintaining it daily by swooping through it and picking up clutter, really gave me a lot more encouragement to keep working on other problem areas. The first room from the front door is what people will see when they enter the house and it can be an encouragement or a discouragement. Make sure the front porch represents what is on the inside of the house. Even if you have nothing, it can at least be swept clean and give people the impression that there is a "keeper" at home. 5. In Sidetracked Home Executives course, that went through the country about 30 years ago, we learned to begin at the front door and work clockwise through the house, leaving the kitchen til last. This is not necessarily deep cleaning, but picking up clutter and making everything at least look nice. We learned never to go anywhere until the kitchen was clean, the dishes washed, the bathroom clean, and the beds made. 6. Children can follow you around from room to room and see what you do and even help. You can give them things to put away. "Run to the bathroom and put this towel in there." "Take this to the kitchen and put it on the table." "Put this in the laundry." Kids love to be gophers and will save you a lot of time. They can put things in the trash, or hand you things while you are working in a room. They can unwind the cord on the vacuume cleaner and wind it back up again. They can save you a lot of time. 7. Having a daily tea time where you put out real china cups and serve just anything, even hot apple juice, makes a great reward, and the children just love it. 8. Reminding the children you are getting ready for Daddy to come home, puts the focus in the right place. Orderliness pleases God, as he, himself, put everything where it belonged, at the creation. Each day, he stood back and said, "It is good." You can look back at each corner of a room and say "This looks good." Check http://homeliving.blogspot.com/2007/01/creating-feeling-of-home.html for a previous post that has more ideas in it. Thanks to every person who so graciously gave her time to add helpful suggestions!